The tumor shown in the images above is seen in a preoperative CT scan image. The posterior plate of the cricoid cartilage can be visualized. Also, a mass is seen eroding the thyroid cartilage and spreading into the soft tissue of the neck. This article focuses on the use of CT imaging in the evaluation of the larynx, with particular focus on laryngeal neoplasia, trauma, foreign bodies, and radiation-induced changes. The larynx begins to develop around the fourth week of development. It begins as an outgrowth from the ventral portion of the primitive pharynx called the laryngotracheal groove, also known as the foregut. The laryngotracheal groove evaginates and eventually forms the laryngotracheal diverticulum, which divides the primitive pharynx into the dorsal esophagus and the ventral respiratory primordium. At this point, the dorsal and ventral aspects are separated by a tracheoesophageal septum (TES), which separates the tracheal lumen from the esophageal tract. Failure in the development of the TES, as seen in laryngeal and laryngoesophageal cleft, results in a communication between the 2 lumens and allows for aspiration of esophageal contents. The laryngotracheal groove also helps to form the primitive opening of the larynx, or aditus, during development. The aditus is composed of 3 structures. The hypobranchial eminence is the most cephalad and develops into the epiglottis. The lateral 2 eminences develop into the arytenoid cartilages. Epithelialization causes the laryngeal lumen to obliterate; the lumen recanalizes later by the 10th week of gestation and, in doing so, helps form the laryngeal ventricles and true and false vocal cords. Failure of complete recanalization results in laryngeal or subglottic stenosis. The fourth branchial arch develops into the supraglottic structures and the muscles that are supplied by the superior laryngeal nerve. These are the thyroid cartilage and the cricothyroid and superior pharyngeal constrictor muscles, respectively. The fifth and sixth branchial arches develop into the glottic and subglottic structures, as well as those muscles that are supplied by the superior laryngeal nerve. These include the cricoid, cuneiform, corniculate, and arytenoid cartilages and all intrinsic muscles of the larynx except for the cricothyroid muscle. Intrinsic muscles of the larynx include the posterior cricoarytenoid muscle, the lateral cricoarytenoid muscle, the thyroarytenoid (and vocalis) muscle, interarytenoid muscle, and, finally, the cricothyroid muscle. Extrinsic muscles of the larynx serve either to elevate or to depress the larynx. The strap muscles (sternohyoid, sternothyroid, thyrohyoid, omohyoids) are the chief extrinsic depressors of the larynx. The extrinsic elevators of the larynx include the geniohyoid, stylohyoid, mylohyoid, and the digastric muscles. The cartilaginous framework is composed primarily of the thyroid cartilage. The thyroid cartilage is formed by 2 alae that meet at an angle anteriorly. The superior cornu is found on the superior aspect of the posterior thyroid alae. The inferior cornu is found on the inferior posterior aspect of the alae and articulate with the cricoid cartilage at the cricothyroid joint. The cricoid cartilage, which is shaped like a signet ring, forms the only complete cartilaginous ring in the tracheobronchial tree. The inferior border of the cricoid cartilage forms the boundary between the larynx and trachea. The anterior portion of the ring lies 2-3 cm below the inferior aspect of the thyroid cartilage. The posterior portion of the cricoid ring (lamina) extends superiorly to the posterior aspect of the vocal cords. The pyramidally shaped arytenoid cartilages are located on the superior aspect of the cricoid lamina and help form the cricoarytenoid joints; each has a vocal process that projects anteriorly and a muscular process that projects posterolaterally. The arytenoids also articulate with the corniculate and cuneiform cartilages at their superior aspects. The vocal process of the arytenoid cartilage can serve as a landmark for the true vocal cords on axial CT imaging. The thyroarytenoid muscle makes up the bulk of the true vocal cord, and its medial portion is referred to as the vocalis. The thyroid, cricoid, and arytenoid cartilages consist of hyaline cartilage, cortical bone, and a marrow space. They demonstrate characteristic patterns of age-related ossification. The other cartilages of the larynx are composed of fibrocartilage and do not typically ossify. Based on its embryological derivation, the larynx can be subdivided into the glottis, supraglottis, and subglottis. The glottis refers to the area of the true vocal folds. The upper border of the glottis is the lower border of the ventricle. The lower border of the glottis is 1 cm below the inferior border of the ventricle. The ventricle is a mucosa-lined pouch that separates the true and false vocal cords. It can vary in size and separates the supraglottis from the glottis. The supraglottis is usually covered with respiratory epithelium. The aryepiglottic folds, which extend from the lateral epiglottis to the arytenoids, and the upper portion of the epiglottis help to form the superior aspect of the supraglottic region. The false vocal folds form the inferior extent of the supraglottis. The subglottis is the region immediately below the vocal folds and extends from the inferior portion of the glottis to the inferior border of the cricoid cartilage. The pre-epiglottic space contains fat and loose fibroelastic tissue. It can be found posterior to the angle of the thyroid cartilage and thyrohyoid membrane, anterior to the infrahyoid portion of the epiglottis, superior to the root of the epiglottis (also known as the petiole), and inferior to the hyoepiglottic ligament. The pre-epiglottic region can be invaded by carcinoma that involves the anterior commissure. It communicates with another important deep laryngeal space, the paraglottic space. The paraglottic space, found between mucosa and the laryngeal framework, may also be invaded by laryngeal carcinoma. Posterosuperiorly, the paraglottic space communicates freely with the pre-epiglottic space. Posteroinferiorly, however, the 2 adjacent spaces are separated by the poorly identified thyroepiglottic ligament. The paraglottic space contains fat and loose fibroconnective tissue and can be found laterally to the thyroarytenoid muscle, surrounding the laryngeal ventricle and extending to the medial aspect of the thyroid cartilage. Superiorly, the space extends into the aryepiglottic folds and, inferiorly, drops to the level of the conus elasticus, which extends from the vocal ligament to the upper border of the cricoid cartilage. The pre-epiglottic space is best studied in the axial and sagittal planes, while the paraglottic space is best evaluated in the coronal plane. Laryngeal mucosa does not typically enhance on contrast-enhanced CT imaging. Fat-containing structures such as the false folds, aryepiglottic folds, and pre-epiglottic and paraglottic spaces, appear as darker areas of hypoattenuation. Layers of connective tissue and fascia, such as the thyroglottic ligament and the cricothyroid membrane, are not well visualized on CT imaging. Huang et al recommend performing CT imaging of larynx with contrast for all patients unless otherwise contraindicated. Contrast allows for better visualization of lesions, assessment of blood flow, differentiation of normal versus abnormal lymph nodes, and differentiation between blood vessel and lymph node. Imaging performed with and without contrast, however, exposes patients to undue radiation exposure. After a complete history is obtained, a physical examination of the head and neck, including a thorough inspection of the larynx, is essential. Indirect laryngoscopy or fiberoptic laryngoscopy allows assessment of the adequacy of the airway and the extent of the tumor. It also allows a dynamic assessment in terms of vocal cord movement and closure of the laryngeal inlet. For small and superficial mucosal tumors, a physical examination that includes indirect laryngoscopy, fiberoptic laryngoscopy, or operative endoscopy is usually effective for evaluating the extent of disease. Imaging cannot adequately differentiate between healthy mucosa and superficial mucosal tumors, and it is not usually required in these cases. However, imaging may be necessary to determine etiology and provide accurate staging, especially in larger tumors or those tumors suspicious for submucosal or deep structure involvement. Clinical examination often cannot assess the deep laryngeal spaces (eg, pre-epiglottic or paraglottic space). Neoplasms may appear as discrete soft tissue masses or as an asymmetry of the soft tissue structures of the larynx. Absent fat planes may also be present and indicate neoplastic spread. The presence (or absence) of disease in the deep paralaryngeal spaces dictates staging, surgical management, and possible therapeutic options. For example, cancer that involves the anterior commissure may be considered T1b, but if it extends 1 cm anteriorly to involve the pre-epiglottic space, it is a T3 cancer. The treatment options for these tumors are very different. Additionally, CT imaging also helps to define patient prognosis. Involvement of the deep paralaryngeal spaces, especially the paraglottic space, has been associated with a more aggressive disease process and a poorer prognosis. Contrast-enhanced CT is highly sensitive for revealing pre-epiglottic and paraglottic space involvement, with values that range from 95-100%. It is highly specific (90-93%) for tumor involvement of the pre-epiglottic space, but it is not as specific (50%) for involvement of the paraglottic space. [9, 10] The paraglottic space can be affected by various systemic inflammatory conditions, as well as by inflammation that results from tumor. Involvement of the paraglottic space may not necessarily represent tumor spread. Imaging may also help define the anatomical origin of laryngeal carcinoma based on characteristic patterns of tumor involvement. For example, supraglottic carcinoma that involves the infrahyoid epiglottis in the region of the petiole tends to present with early inferior pre-epiglottic space invasion. It also may involve the anterior commissure and can spread to the subglottis. Imaging is especially important in the evaluation of cartilage involvement. Thyroid cartilage invasion suggests more aggressive disease, and this is reflected in the American Joint Committee on Cancer (AJCC) system of staging; thyroid cartilage invasion is considered stage 4 disease. MRI appears to be superior to CT scanning for evaluating cartilage invasion, although both techniques can yield false-positive results. Reactive inflammation, when present, can overestimate the likelihood of neoplastic cartilage invasion. The images below illustrate the case of a large right-sided transglottic squamous cell carcinoma. This patient presented for evaluation after being hoarse for many months. The first and second images are pictures of the total laryngectomy specimen. The third, fourth, and fifth images are from the preoperative CT scan. Tumors of this size are not difficult to diagnose on physical examination, although the extent of cartilage invasion is hard to determine. CT imaging is an essential adjunct to the proper evaluation of laryngeal neoplasms. See the images below. Laryngectomy specimen. The larynx has been opened by a posterior vertical cut. An ulcerative lesion of the endolarynx is visible and appears to be transglottic, more so on the right side than the left. A close-up view of the laryngectomy specimen shown in the image above. Preoperative CT scan image of the tumor shown in the laryngectomy specimen images above. This picture demonstrates a higher level in the larynx than the level seen in the first CT image above. 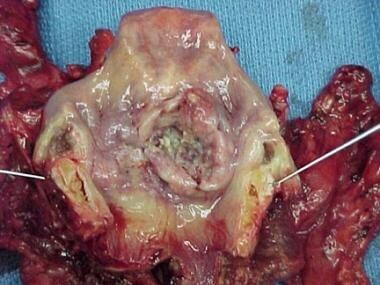 Again, the thyroid cartilage is seen to be eroded. The airway also appears to be compromised. 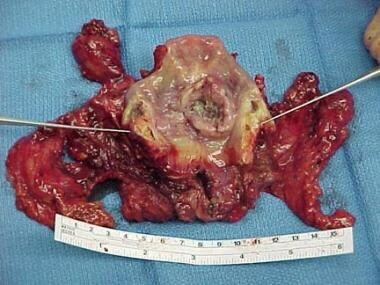 Erosion of the thyroid cartilage by the tumor seen in laryngectomy specimen images is demonstrated in this picture. The tumor appears to be eroding the anterior commissure area of the thyroid cartilage. The tumor appears large and predominately on the right side of the larynx. The airway also appears to be compromised. Blunt laryngeal injury can result from high-speed, high-energy trauma, often along with other facial and bodily injuries. Blunt injuries can also occur as a result of relatively minor insults to the anterior neck that cause posterior compression of the larynx against the spine. Rapid and accurate diagnosis is essential for proper treatment. Any patient who has evidence of laryngeal involvement based on examination findings, such as intralaryngeal hematoma, mucosal laceration, loss of healthy laryngeal crepitus, or loss of the prominence of the thyroid cartilage, should undergo spiral CT or multidetector CT (MDCT)scan of the larynx, if stable. [13, 14] Maintaining a patent airway is always the top priority. CT scan helps to identify injury to the thyroid cartilage, cricoarytenoid joint, and cricothyroid joint and also aids in planning surgical reconstruction. With thin-slice imaging, fractures may appear as discontinuities of the cartilage, with or without displacement. Arytenoid dislocation and subluxation can also be appreciated on thin-slice CT and with 3-dimensional reconstruction techniques. Soft tissue emphysema, a classic sign of laryngeal fracture, may also be seen on CT imaging. Indeed, recent evidence has suggested the superiority of the MDCT, which allows compilation of volume data rather than individual slices at higher speeds. Most importantly, MDCT allows for 2-dimensional image reformation and 3-dimensional image reconstruction. Becker et al demonstrated increased detection of evidence of laryngeal trauma, including hyoid bone and laryngeal fractures and arytenoid luxations and subluxations with the use of this technology versus axial CT only. Thus, spiral CT scanning, along with multidetector acquisition, is extremely helpful for early diagnosis of laryngeal fracture. Both are significantly faster than conventional CT scanning and may improve detail in laryngeal imaging by reducing motion artifact due to respiration. Advances in CT technology continue to result in shorter acquisition times, improved resolution, and ease of 3-dimensional applications. In addition, other structures can be assessed with CT scan when the larynx is evaluated. The cervical spine is paramount in triage of traumatic injuries to the neck, and it can be rapidly assessed using a CT scan. In addition, a CT scan with intravenous contrast can help diagnose other life-threatening sequelae of neck trauma, such as carotid artery occlusions, dissections, or pseudoaneurysms. Unusual late results of penetrating trauma, such as traumatic laryngocele, can be diagnosed based on follow-up CT scan results. CT scan improves the accuracy of diagnosis by delineating details of the upper aerodigestive tract. In clinical situations in which the physical examination findings suggest cellulitis instead of abscess, a CT scan can assist in the diagnosis and can aid in surgical planning. Abscesses appear as soft tissue masses with a core of hypoattenuation on CT scan images. These soft tissue densities are often enhanced around the periphery, although this is not always the case. The surrounding fat often contains strands of soft tissue density due to surrounding inflammation, and the adjacent lymph nodes are usually enlarged. A CT scan can help distinguish between abscess and tumor, but necrosing and infiltrating neoplasms may mimic the findings of an abscess. 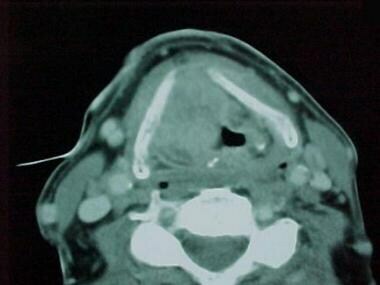 CT scan may provide important information about the spread of infection to fascial compartments of the neck and can assist head and neck surgeons in decisions about intervention in unusual situations such as epiglottic abscesses or laryngopyoceles that may manifest as supraglottic or intralaryngeal masses. Radiation therapy has been used successfully for decades in the treatment of laryngeal malignancies. It can, however, result in significant complications that may be appreciated on CT imaging. Benign tumors such as lipomas or neurofibromas can manifest as supraglottic or subglottic masses. A CT scan can be helpful in differentiating benign processes from malignant processes by defining tumor borders, cartilage invasion, and the anatomy of the paraglottic space. Lipomas can be diagnosed based on their density, which is similar to the density of normal fat. Disorders of the larynx can be the first manifestation of systemic disease. A CT scan can assist in diagnosing and monitoring the progression of diseases such as Wegener granulomatosis and bullous pemphigoid, which might otherwise require direct laryngoscopy with the patient under general anesthesia. Autoimmune diseases such as rheumatoid arthritis can manifest with rheumatoid nodules of the true vocal folds and thyroid cartilage or effusion of the cricoarytenoid joint, which can be clearly distinguished with CT scan. CT scan can aid in the diagnosis of laryngeal amyloidosis by showing characteristic submucosal involvement with lack of invasion into extralaryngeal spaces. 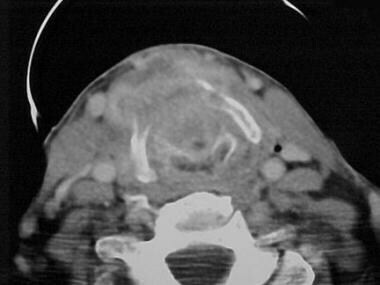 Congenital lesions such as branchial cleft anomalies can be diagnosed using a combination of contrast-assisted CT scan and endoscopy and can be differentiated from other deep neck processes such as abscessed lymph nodes. Branchial cleft cysts usually appear as well-defined, fluid-density structures at the anterior aspect of the sternocleidomastoid muscle near the angle of the mandible. Chang EW, Kobler JB, Yun SH. Triggered optical coherence tomography for capturing rapid periodic motion. Sci Rep. 2011. 1:48. [Medline]. [Full Text]. Stratemann S, Huang JC, Maki K, Hatcher D, Miller AJ. Three-dimensional analysis of the airway with cone-beam computed tomography. Am J Orthod Dentofacial Orthop. 2011 Nov. 140(5):607-15. [Medline]. Henrot P, Blum A, Toussaint B, Troufleau P, Stines J, Roland J. Dynamic maneuvers in local staging of head and neck malignancies with current imaging techniques: principles and clinical applications. Radiographics. 2003 Sep-Oct. 23(5):1201-13. [Medline]. Nemec SF, Krestan CR, Noebauer-Huhmann IM, et al. [Radiological normal anatomy of the larynx and pharynx and imaging techniques.]. Radiologe. 2009 Jan. 49(1):8-16. [Medline]. Becker M. Larynx and hypopharynx. Mafee M, ed. Valvassori's Imaging of the Head and Neck. 2nd ed. Theime: 2005. 731-779. Dadfar N, Seyyedi M, Forghani R, Curtin HD. Computed tomography appearance of normal nonossified thyroid cartilage: implication for tumor invasion diagnosis. J Comput Assist Tomogr. 2015 Mar-Apr. 39 (2):240-3. [Medline]. Huang BY, Solle M, Weissler MC. Larynx: anatomic imaging for diagnosis and management. Otolaryngol Clin North Am. 2012 Dec. 45(6):1325-61. [Medline]. Becker M. Larynx and hypopharynx. Radiol Clin North Am. 1998 Sep. 36(5):891-920, vi. [Medline]. Zbaren P, Becker M, Lang H. Staging of laryngeal cancer: endoscopy, computed tomography and magnetic resonance versus histopathology. Eur Arch Otorhinolaryngol. 1997. 254 Suppl 1:S117-22. [Medline]. Adolphs AP, Boersma NA, Diemel BD, et al. A systematic review of computed tomography detection of cartilage invasion in laryngeal carcinoma. Laryngoscope. 2015 Jul. 125 (7):1650-5. [Medline]. Becker M, Zbaren P, Laeng H, Stoupis C, Porcellini B, Vock P. Neoplastic invasion of the laryngeal cartilage: comparison of MR imaging and CT with histopathologic correlation. Radiology. 1995 Mar. 194(3):661-9. [Medline]. Juutilainen M, Vintturi J, Robinson S, Bäck L, Lehtonen H, Mäkitie AA. Laryngeal fractures: clinical findings and considerations on suboptimal outcome. Acta Otolaryngol. 2008 Feb. 128(2):213-8. [Medline]. Becker M, Duboé PO, Platon A, Kohler R, Tasu JP, Becker CD, et al. MDCT in the assessment of laryngeal trauma: value of 2D multiplanar and 3D reconstructions. AJR Am J Roentgenol. 2013 Oct. 201(4):W639-47. [Medline]. Yellon RF. Head and neck space infections. Bluestone CD, Casselbrant ML, Stool SE, et al, Eds. Pediatric Otolaryngology. 4th ed. Philadelphia, Pa: WB Saunders; 2003. 1681-1701. Roh JL. 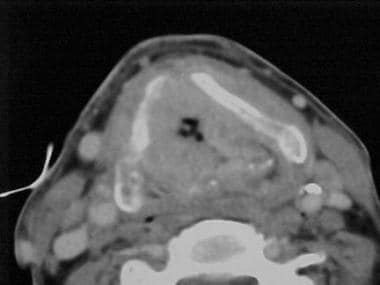 Chondroradionecrosis of the larynx: diagnostic and therapeutic measures for saving the organ from radiotherapy sequelae. Clin Exp Otorhinolaryngol. 2009 Sep. 2(3):115-9. [Medline]. [Full Text]. Rossler L, Rothoeft T, Teig N, Koerner-Rettberg C, Deitmer T, Rieger CH, et al. Ultrasound and colour Doppler in infantile subglottic haemangioma. Pediatr Radiol. 2011 Nov. 41(11):1421-8. [Medline]. Pretorius PM, Milford CA. Investigating the hoarse voice. BMJ. 2008 Oct 8. 337:a1726. [Medline].